Continuing our trend for visiting National Parks, we decided to visit two on one trip. Zion National Park and Bryce Canyon National Park are both parks that I visited when I was a child. Seeing it through my daughter’s eyes was an added bonus. 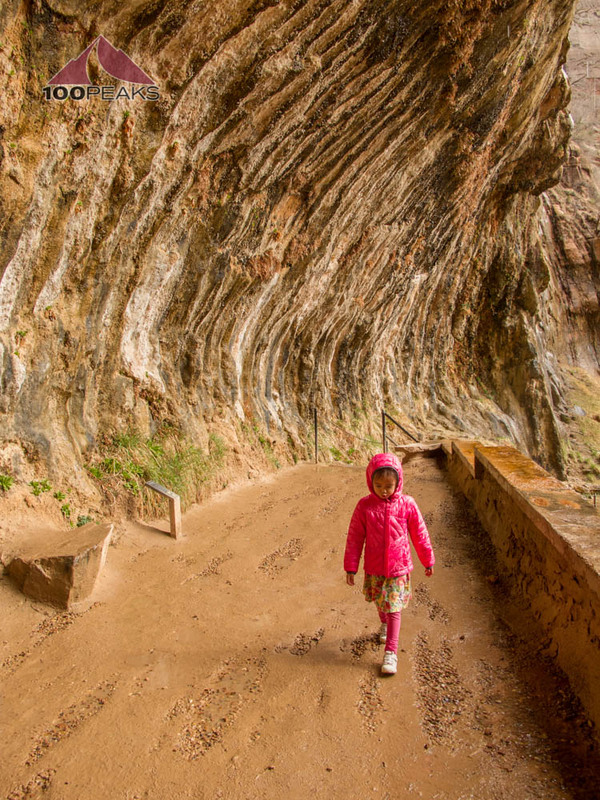 A trend I have seen in National Parks since my childhood is that they’ve become even more kid-friendly and a great family experience. We arrived in St. George after spending the night in Las Vegas. Sophia enjoyed the Bellagio fountain for about an hour the night before, but we were ready for some exploration into the desert. 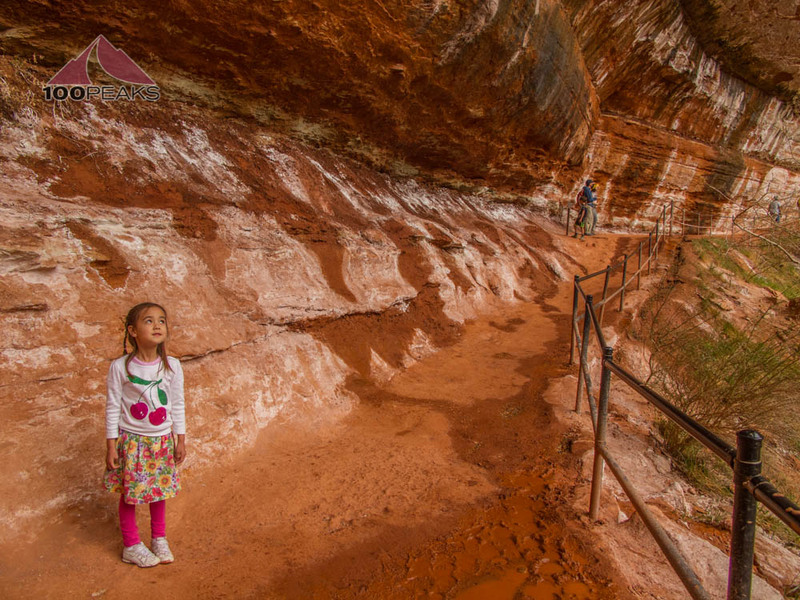 Upon arriving at the Zion National Park Visitor Center, we felt embraced by the canyon. The walls rose above us on either side. We learned that, contrary to what was posted on their website, the shuttles were in service early and we would be required to ride it to get into the park. On the minus side, the end of the day required us to wait for shuttles with very little space, and stand in the packed shuttle in for about an hour, as the shuttle slowly made its way down south, stopping at every stop along the way. On the plus side, the canyon was quieter and much more pollution-free and searching for parking was unnecessary at the popular trail heads. After picking up the Junior Ranger information and getting some advice from the rangers on staff, we got on the shuttle and decided to hike the Emerald Pools Trail. We crossed the Virgin River and headed up the trail. It is fairly level and a great trail for Sophia. Before long, we encountered some interesting rock formations. The soft sandstone had been eroded, leaving a fun hole in the rock. Also, where you have people and soft sandstone, you will have graffiti. I am not sure why I continually expect people to respect nature, as I am continually disappointed. From my experience in the outdoors, easy access + popular outdoor sites = graffiti + litter. I simply wish the parents of today will stop the cycle and be role models as stewards of our public lands. My rant is over and may be revisited by a future blog post. We made it to the Emerald Pools, which weren’t very emerald on this day, perhaps due to the clouds. We stopped, enjoyed the grotto, had a snack, and continued on. The trail on this north side of the pools was very pleasant with a little stream, and a narrow path through some tall rocks. Sophia, wanting a break from hiking, climbed onto a rock and started practicing the art of cairn-making. We all got a little breather and enjoyed the sound of birds and the river below. The weather was perfect, and although it was Spring Break for much of the country, it was still very pleasant and not as crowded as anticipated. We ended up at the next stop and hopped onto the shuttle to head to the Weeping Wall, a short but steep hike to a grotto that drips water from above. Sophia played with the drops and told us she was collecting tears. After the weeping wall, we decided to call it a day, since it was starting to get dark. The next day, we got up late and spent the morning reading and lounging around. We didn't make it to the park until around noon. 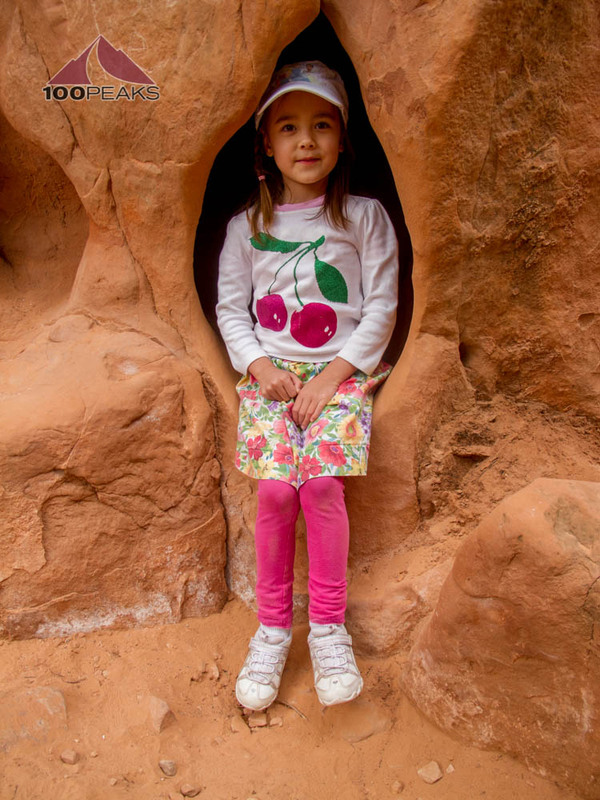 Before we left on this trip, I had high hopes that I would be able to steal away for a while and hike Angel's Landing, but, as it usually happens on family trips, I got overcome with guilt about leaving my family to hike solo, so I started to talk myself out of it. We were having lunch, and I was almost resigned to the fact that I was going to be unable to do Angel’s Landing when my wife leaned over and said, "Didn’t you want to go on that hike? We’re leaving to Bryce today, so this is your last chance." She assured me that they will be fine and explore by the stream. I ran to the shuttle and made it the Angel’s Landing Trailhead, excited to be hiking this infamous trail. With a bounce in my step, I started up the trail. Before long, it got pretty steep. 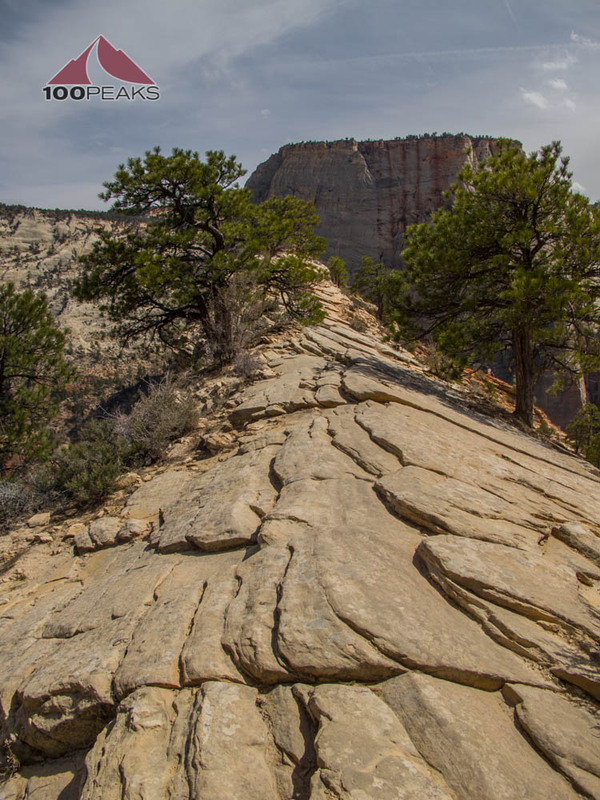 From afar, it was hard to tell how this trail was going to make it up that narrow strip of rock that jutted into Zion Canyon. As I got closer, I could see the trail carved into the cliff face. This was an incredible feat of engineering. Once I got my wind, I started passing people. I was pushing myself. I had agreed to meet my family at a certain time, and I didn’t want to be late, since there was no cell coverage in the canyon. I continued along the trail as it went deep into the cliff. The trail wrapped around the back of the ridge and climbed steeply in narrow switchbacks. I got to Scout Lookout, where everyone was relaxing and eating lunch. This was a turnaround point for those who weren’t comfortable with the upcoming exposure. I paused for a second, thinking about the deaths along the trail. Was I going to be able to handle the exposure? How was the trail going to affect me? Taking a break only to put on some gloves, I started the climb. From time to time, I had to wait for others to come down the trail, and other times I needed to stop to catch my breath, since much of this trail was akin to climbing a ladder. Keeping an eye on the time, I pushed ahead. I had some concern about some hikers I encountered, who seemed uneasy with the drop-offs on either side of trail. I knew from experience that exposure is more challenging going down than up. So if their legs were shaky going up, I worried about their descent. But they were all adults, making their own choices. Before long, I was on the top ridge and heading towards the edge. I was elated. I was a little anxious about what the way down would be like, but for now, I scooted to the edge and took some pictures and ate a snack. The view was incredible and the trail not as challenging as I had anticipated. Checking the time, I got up and headed back, ready to face my fear of looking exposure in the face. On the way up, I was looking up, toward the chain for the next foot-or handhold. On the way down, I was staring straight at my potential demise. However, I felt nothing but excitement. I encountered another hiker that kept a great pace and we were skipping and hopping down the trail, virtually riding the chains down the narrow ridge. In a matter of minutes, I was back to Scout Lookout and catching my breath. That was exhilarating. Chasing the clock, I starting running down the rest of trail, much of which is paved. It had been a while since I’ve done a real trail run, but I was invigorated both by tackling my fears and by having a blast on the way down the ridge. I couldn’t help myself. I made it back to the shuttle stop and turned and looked back up at Angel’s Landing, this orange strip of rock protruding into Zion Canyon. I met up with my family and was probably gushing with energy. I was grateful to have had the opportunity to explore that hike. We said goodbye to Zion National Park and headed to Bryce National Park, which will be available in Part 2 of this trip when I write it. Zion is truly a special place, and like some of our other national park trips, like Glacier National Park or Yosemite National Park, we really only scratched the surface of what the park offered us.